St. Stephen will offer High Mass for the Feast of the Annunciation, Tues Mar 25, at 6:30pm. Also, because its a Tuesday, St. Stephen will have the regularly celebrated Low Mass at 7am. 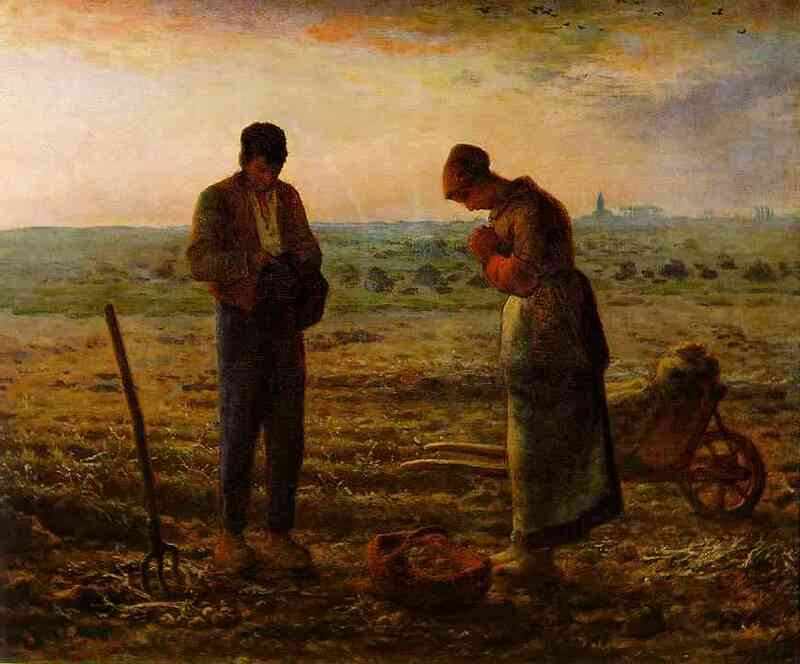 Remember to pray the Angelus three times everyday: morning (6am), noon and evening (6pm). Hail Mary, full of grace, the Lord is with thee; blessed art thou among women and blessed is the fruit of thy womb, Jesus. Holy Mary, Mother of God, pray for us sinners, now and at the hour of our death. Amen. Let us pray: Pour forth, we beseech Thee, O Lord, Thy grace into our hearts; that we, to whom the incarnation of Christ, Thy Son, was made known by the message of an angel, may by His Passion and Cross be brought to the glory of His Resurrection, through the same Christ Our Lord. Amen. V. Ángelus Dómini nuntiávit Maríae. R. Et concépit de Spíritu Sáncto. Áve María, grátia pléna, Dóminus técum; benedícta tu in muliéribus, et benedíctus frúctus véntris túi, Jésus. Sáncta María, Máter Déi, óra pro nóbis peccatóribus, nunc et in hóra mórtis nóstræ. Ámen. R. Fiat mihi secúndum vérbum tuum. V. Et Vérbum cáro fáctum est. R. Et habitávit in nóbis. V. Ora pro nóbis Sáncta Dei Génitrix. R. Ut dígni efficiáur promissiónibus Christi. 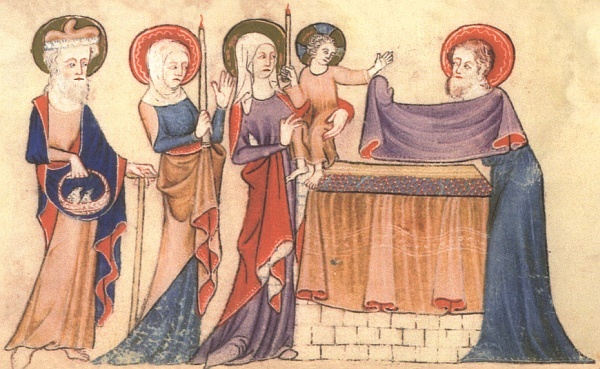 Oremus: Grátiam túam quaésumus, Dómine, méntibus nóstris infúnde: ut qui, Ángelo nuntiánte, Chrísti Fílii tui Incarnatiónem cognóvimus; per Passiónem Ejus et Crucem, ad resurrectiónis glóriam perducámur. Per eundem Chrístum Dóminum nóstrum. Ámen. 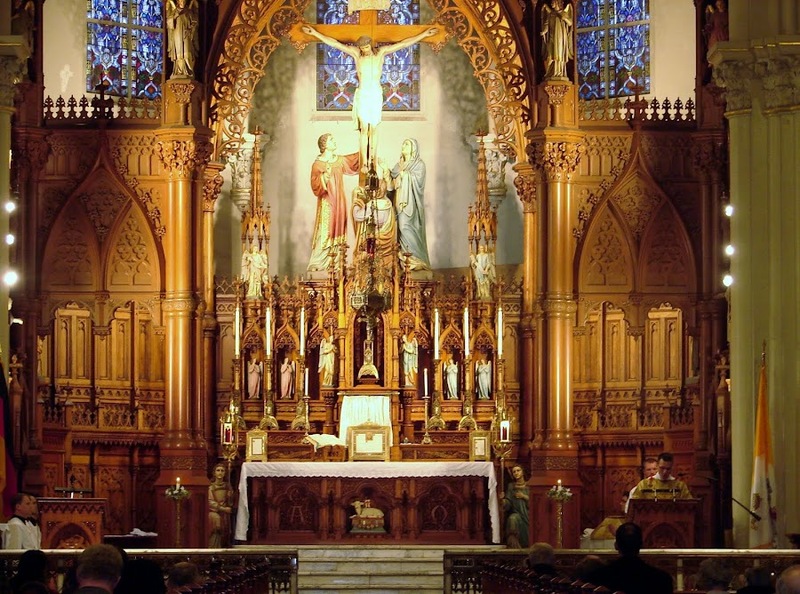 SOLEMN HIGH MASS with The Lyceum Schola Cantorum, Laetare Sunday, March 30th at 5:00 p.m. Sacred Heart of Jesus Parish, 1545 South Green Road, South Euclid, Ohio. St. Stephen will offer High Mass on the Feast of St. Joseph, Wednesday, March 19, at 6:30pm. St. Joseph is a popular figure in Christian art. Signs and Symbols in Christian Art, by George Ferguson, gives the following entry for St. Joseph. St. Joseph, husband of the Virgin Mary, was a carpenter of Nazareth. 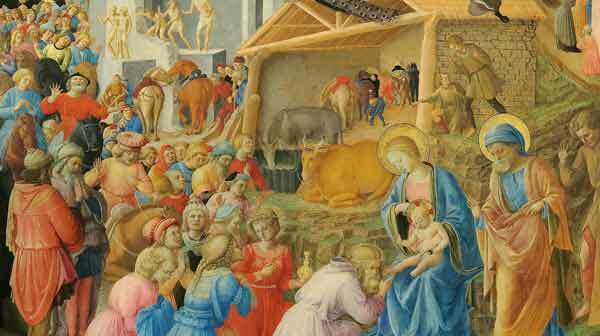 He frequently appears in paintings of the life of Christ, particularly in those of the birth of Jesus and in the other infancy narratives. He is frequently shown with a budded staff in his hand. This refers to the legend that, when the Virgin Mary was fourteen years old, each of her suitors left her suitors left his staff at the temple, hoping for a sign to indicate which of them was most favored by God. In the morning, Joseph's staff was budding into leaf, and from it came a dove that flew up to Heaven. Other attributes of St. Joseph are a carpenter's plane, saw, and hatchet, and the lily, symbol of his purity. Often, in scenes of the Presentation, he carries two doves in a basket. St. Joseph is the Patron of the Universal Church. And he is the patron of the dying. Since we all must die, we should cherish a special devotion to St. Joseph, that he may obtain for us a happy death. All Christians regard him as the advocate of the dying who had honored him during their life, and they do so for three reasons: First, because Jesus Christ loved him not only as a friend, but as a father, and on this account his mediation is far more efficacious than that of any other Saint. Second, because St. Joseph has obtained special power against the evil spirits, who tempt us with redoubled vigor at the hour of death. 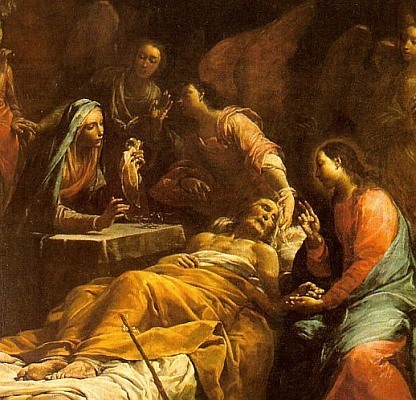 Third, the assistance given St. Joseph at his death by Jesus and Mary obtained for him the right to secure a holy and peaceful death for his servants. Hence, if they invoke him at the hour of death he will not only help them, but he will also obtain for them the assistance of Jesus and Mary. A traditional devotion during Lent is to meditate upon the Four Last Things: death, judgment, heaven, hell. Holy Mother Church encourages us to think of death, and as St. Joseph is the patron of a happy death, perhaps we should invoke him often. O St. Joseph whose protection is so great, so strong, so prompt before the throne of God, I place in you all my interests and desires. 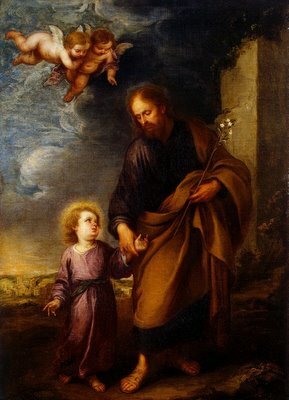 O St. Joseph do assist me by your powerful intercession and obtain for me from your Divine Son all spiritual blessings through Jesus Christ, Our Lord; so that having engaged here below your heavenly power I may offer my thanksgiving and homage to the most loving of fathers. O St. Joseph, I never weary contemplating you and Jesus asleep in your arms. I dare not approach while He reposes near your heart. Press Him in my name and kiss His fine head for me, and ask Him to return the kiss when I draw my dying breath. St. Joseph, patron of departing souls, pray for us. Amen. This should have been posted a while back..
As officially reported on the parish's website on 3/8/2014, the new pastor of Immaculate Conception in Willoughby, Ohio, has cancelled the Traditional Latin Mass which was offered there regularly on Friday evenings. The announcement can be seen on the website, and the parish has released a document with a few more details. Many may know of the existence of Ember Days, but how many know the history and meaning of them? Wednesday, Friday and Saturday this week are known as Lenten Embertide. The Ember Days occur four times per year, in conjunction with the four seasons. Traditionally speaking, they are days of fasting and abstinence. A post on Rorate Caeli from way back in 2008 gives a good account of the Ember Days' history, meaning and significance, particularly how today's culture, so zealous for being good stewards of the earth, is missing the element of the Supernatural Mysteries, which Ember Days embodies in the very nature of its liturgical meaning. Help resurrect the pious observation of Ember Days, a tradition which goes back to the earliest times of the Church. Fisheaters also has a good summary of Ember Days. 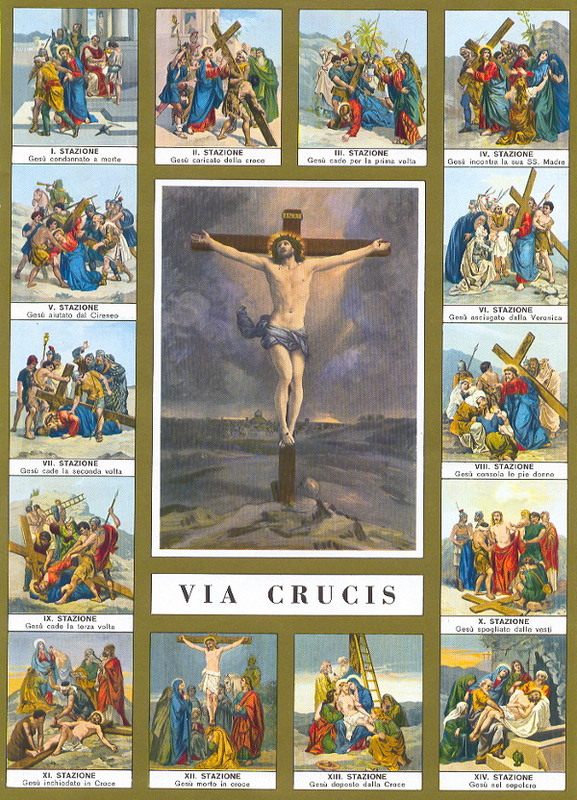 "O Holy Father, may the torrents of love flowing from the sacred wounds of Thy Divine Son bring forth priests like unto the beloved disciple John who stood at the foot of the Cross; priests: who as a pledge of Thine own most tender love will lovingly give Thy Divine Son to the souls of men. May Thy priests be faithful guardians of Thy Church, as John was of Mary, whom he received into his house. Taught by this loving Mother who suffered so much on Calvary, may they display a mother’s care and thoughtfulness towards Thy children. May they teach souls to enter into close union with Thee through Mary who, as the Gate of Heaven, is specially the guardian of the treasures of Thy Divine Heart. Give us priests who are on fire, and who are true children of Mary, priests who will give Jesus to souls with the same tenderness and care with which Mary carried the Little Child of Bethlehem. Mother of sorrows and of love, out of compassion for Thy beloved Son, open in our hearts deep wells of love, so that we may console Him and give Him a generation of priests formed in thy school and having all the tender thoughtfulness of thine own spotless love. Amen." Thanks to some friends of the TLM, we are posting that St. Sebastian in Akron will also offer High Mass on Ash Wednesday at 5:15pm. Latin Masses announced so far for Ash Wednesday are as follows. We are reminded that Ash Wednesday is a day of abstinence and fasting. Cleveland Friends of the TLM promotes awareness of and participation in the Traditional Latin Mass throughout the Diocese of Cleveland. Let us pray for Francis, our Pope. May the Lord preserve him, and give him life, and make him blessed upon the earth, and deliver him not up to the will of his enemies. Amen.